In a society that is constantly updating and upgrading mass-produced products, Michael Hanley is hoping to inspire a more sustainable way of living by transforming people’s old, forgotten objects into unique home wares. 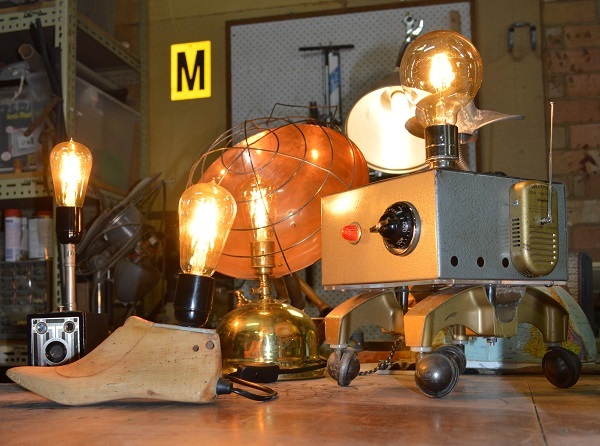 Michael is the founder of Upswitch, a Melbourne-based company that takes any old object you can think of, from microscopes and brownie box cameras to globes and blenders, and turns them into lamps in a process known as upcycling. Upcycling has been around since humans have been making objects but has grown in popularity recently as slowing economies around the world bring increased awareness of environmental responsibility and the unsustainable demand for raw materials. Upcycling has become so popular that there is now a national day set aside to celebrate the process, held on 24 June every year as part of National Recycling Week. Michael says he was inspired to begin upcycling by the artists’ markets he saw while travelling through Germany in 2014, which were filled with repurposed and custom-made items. “I’ve always loved collecting old items that have been made redundant by ever-changing technology or that people have no use for anymore. So I was collecting a lot of things but I found I wasn’t doing anything with them. 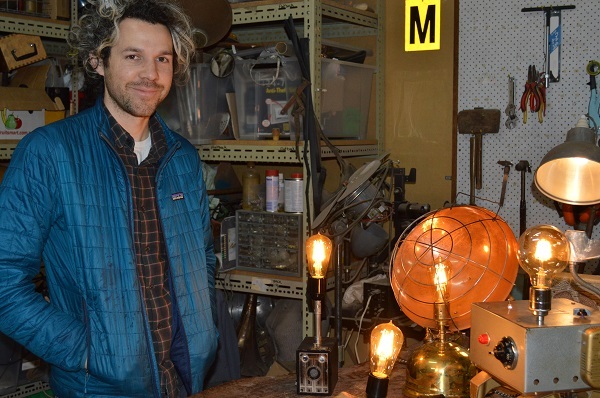 After seeing the markets in Germany and finding a community of DIY-ers online who were re-inventing discarded objects I got the idea to turn these items into lamps,” says Michael. When he started out, Michael didn’t have any background in electronics or design but says he’s always loved making and fixing things. He learned quickly and two years ago Michael turned Upswitch into a business with help from the New Enterprise Initiative Scheme (NEIS). This scheme is run by the Australian Government, providing accredited small business training, income support and personalised mentoring to help people become self-employed business owners. Michael now has a workshop in Brunswick, Melbourne, as well as an online store, and travels around the country to sell his pieces at design markets. 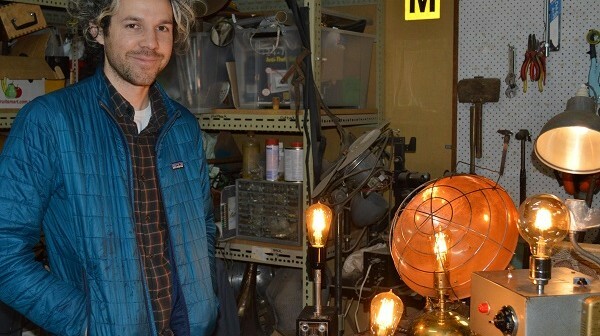 He says 70% of his day involves building the lamps and 30% is spent trawling through op-shops, markets, garage sales and online sites such as e-bay and Gumtree looking for items to transform. Customers can also bring in their own objects, with the design informed by the items original use. “Sometimes though, it’s a mad scientist fusion to create these pieces. I might have a small idea and pick through parts that will work for the next step of the process but because I have too many parts to remember them all, it’s hard to design something in my head first,” says Michael. 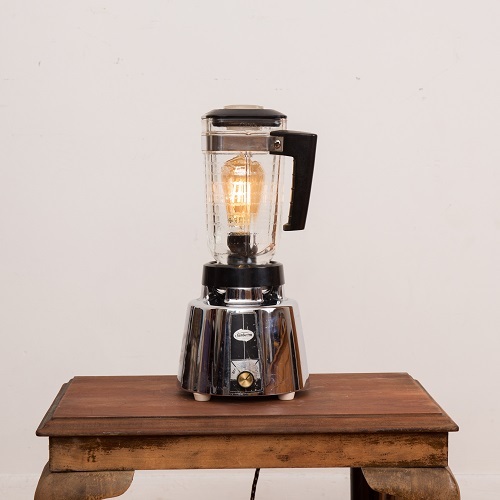 The lamps are all individually handmade using high quality components and each one comes with a low wattage LED filament bulb. The light bulbs are specially made for Upswitch to create the look and warm colouration of antique Edison filament bulbs but with the long lasting, energy saving benefits of LED. As for why Michael chooses to repurpose the items into lamps. See all Michael’s lamp designs on the Upswitch website.